Can The Mets Possibly Be This Good? Wilmer Flores of the New York Mets celebrates Sunday after hitting a walk-off home run. A couple of weeks ago, it was anybody’s guess as to which version of the New York Mets would show up for the 2018 season. Would it be something like the 2016 edition, a solid ballclub that reached the NL wild-card game on dominant pitching and a streaky offense? Or the 2017 squad, an injury-riddled catastrophe from almost start to finish? Or maybe some third kind of team: one possibly able to coalesce into a legitimate contender with better health and a new manager? A great (and also frustrating) thing about baseball is that, 14 games into the schedule, we still don’t really know the answer. But what few clues the 2018 Mets have provided are mostly encouraging. At 12-2, including Sunday’s walk-off victory over the Milwaukee Brewers, New York is baseball’s second-best team record-wise, trailing only the Boston Red Sox. Ability-wise? Maybe not quite so much. But the team has at least shown that, when it’s healthy — a caveat that perpetually hangs over the franchise — it has the potential to break into MLB’s upper echelon. When the current-era Mets were at their best in the 2015 and 2016 campaigns, their success largely depended on having an elite pitching staff, one that finished a close second behind the Washington Nationals in pitching wins above replacement (WAR)1 over those seasons. The key was a core of flame-throwing pitchers the likes of which had seldom been seen before: a rotation with Noah Syndergaard, Matt Harvey, Jacob deGrom and Steven Matz,2 each of whom ranked among the 35 hardest-throwing starters in MLB, plus a bullpen backstopped by fireballing closer Jeurys Familia. According to WAR, Mets pitchers’ production represented more than half of the team’s value (52 percent) in 2015 and 2016, compared with the league average of only 42 percent of WAR coming from pitchers. By comparison, the rest of the team was pretty unremarkable in the span, ranking 16th in total WAR from position players. While the lineup had its moments — Yoenis Cespedes’s ridiculous late-season tear in 2015 comes to mind — it was mostly inconsistent, too reliant on the home run and lacking in high-impact talent (especially when Cespedes was injured). And the defense was nothing special, either. 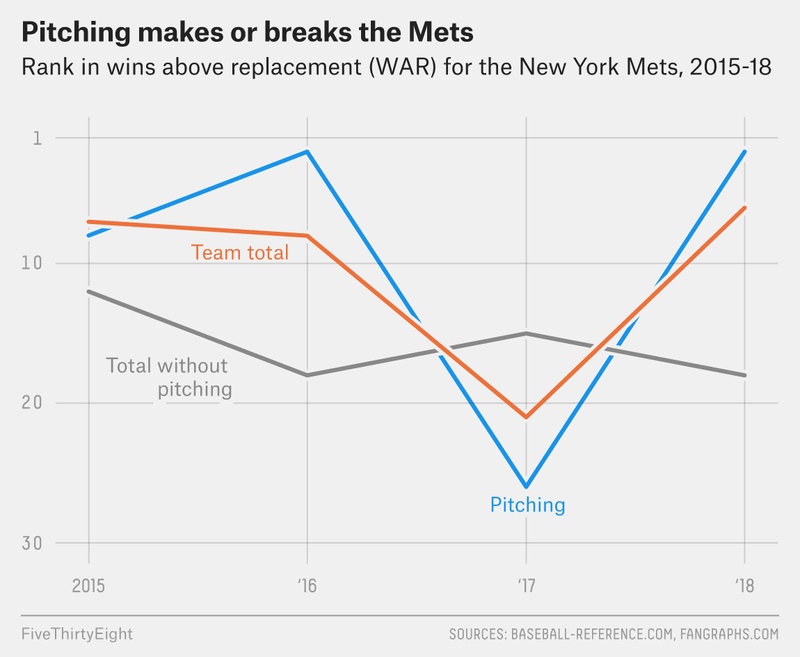 So it was no surprise that when the Mets’ pitching collapsed entirely in 2017, dropping all the way down to 26th in WAR because of a combination of injuries and underperformance, the team fell apart as well. There was nothing left to make up the difference. By the same token, it shouldn’t be a surprise that this year’s improved health and performance on the mound has the Mets back on track. According to WAR, New York ranks second in total pitching value once again, trailing only the Red Sox. The rest of the team has had its bright spots, including the early season play of newly acquired third baseman Todd Frazier, but by and large it’s been the same formula as in the team’s successful 2015 and 2016 seasons: Win with dominant pitching, solid hitting and a mediocre-yet-passable combination of base running and fielding. So it’s still too early to say whether this staff will stay healthy enough all season to keep up its early pace, or if it has enough depth to survive the kinds of injuries that happen to normal teams — even if this year’s Mets aren’t as snakebit as last year’s were. But if they do keep it up, the Mets will join the 1998 San Diego Padres as the only team in MLB’s expansion era to go from the top five in pitching WAR one season to the bottom five the next, and then back to the top five the following year.4 That team ended up going to the World Series; we’ll have to see whether this year’s Mets can follow in those footsteps and cash in on their own red-hot start. Averaging together the versions of WAR found at Baseball-Reference.com and FanGraphs. Matz was called up for good late in the 2015 regular season and was in the Mets’ rotation for that postseason. Not that Harvey has been amazing, mind you: He’s the only Mets starter with an ERA worse than league average this season. Similar to the 2017 Mets, the 1997 Padres were ravaged by injuries and underperformance.